After a dam breach, coal ash is in North Carolina waters. Duke Energy has said its water tests show they are within permitted standards for arsenic and other contaminants– but pictures and video of the pollution tell a different story. 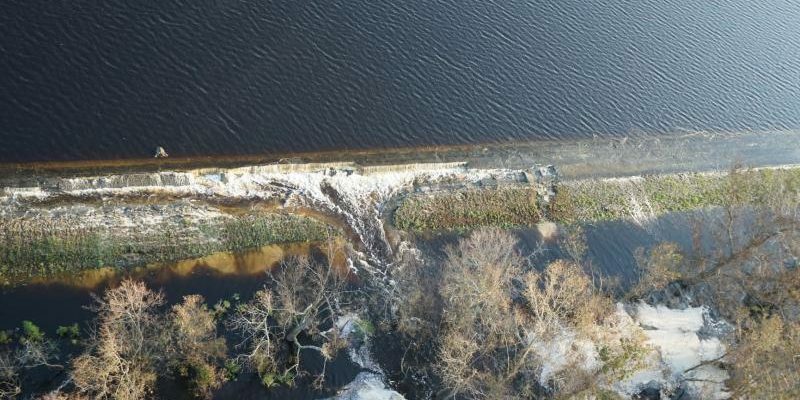 The aftermath of Hurricane Florence caused Duke Energy’s Wilmington power plant to be breached by floodwaters. Coal ash, dumped into the Cape Fear River. Duke Energy said that floodwaters continued to spill over a dike at the north side of Sutton Lake, a 1,100-acre (445-hectare) reservoir at the L.V. Sutton Power Station. The water caused several breaches in the dam on the south end of the lake. Gray material, which Duke refers to as lightweight coal combustion byproducts, were recorded in the water. Coal ash is what’s left over after coal is burned to generate electricity. It includes mercury, lead, arsenic and other toxic heavy metals. The inundated basin contains at the plant 400,000 cubic yards (305,820 cubic meters) of ash, WUNC News reported. Duke Energy has caused a number of environmental contamination incidents even after it retired a coal-fire plant in 2013 that used Sutton Lake as its coaling pond. A week prior to the dam breaking, there was a breach at a nearby coal ash landfill that spilled “enough material to fill 180 dump trucks.” WUNC reported. Three old coal-ash dumps capped with soil were underwater at a Goldsboro plant after the Neuse River flooded. As a result, Duke Energy plead guilty to nine Clean Water Act violations and paid $102 million in fines and restitution for illegally discharging pollution from ash dumps at five North Carolina power plants. It plans to close all its ash dumps by 2029. Yet the pollution continues, and Duke Energy has “fought coal ash cleanup at every turn,” Waterkeepers North Carolina maintains.